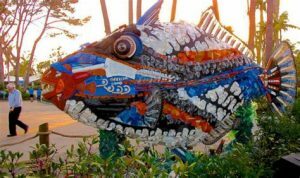 Art to Save The Sea will occur May 6th 5:30 -7:30pm at the Bay City Art Center and May 7th 5:30 – 7:30pm at Seaside Brewing. Search Eventbright “Art To Save The Sea” for additional events in Gleneden Beach, Yachats, and Brookings. 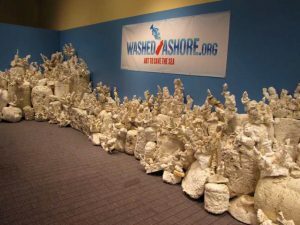 Attendees of these gatherings will learn the process behind these masterpieces and see a visual presentation by John Tannous, Executive Director of Washed Ashore which explains everything.